PUPILS from Robert Gordon’s College are presenting ‘Stardust’ at Aberdeen Arts Centre next week. It is believed to be the first time that Neil Gaiman’s much-loved, breathtaking and magical novel has been performed on stage. This fairy tale will make you laugh out loud and believe in love again. In a tiny countryside town called Wall, a young man Tristan Thorn (played by Adam Mackay, age 16) has lost his heart to the beautiful Victoria Forester (played by Bea Middelthon, age 16). He promises his beloved that he will retrieve a fallen star by venturing into the magical realm beyond the Wall and deliver it to her, for the prize of her hand. The star is no lump of rock, it has transformed into a spirited girl called Yvaine (played by Thea Mayeux, age 15). However, Tristan is not the only one seeking the star. Also looking for her are three witches, (played by Dominique Santini, age 17, Lucy McLennan, age 16 and Louise Ouston, age 17) who want to cut out her heart to make them young; and, the sons of the dead king of Stormhold (played by Benjamin Osugo, age 15 and Max Greenhalgh age 14) who want her because she holds a ruby that will give one of them the title to the throne. Assisting Tristan on his quest is his mother (played by Ellé Miles, age 17), the victim of a spell, and a cross-dressing pirate of the skies called Captain Shakespeare (played by Ewan Bruce, age 14). Mr Andy Milarvie, show director and head of drama, said: “By bringing our artistic and technical stage craft together we have created a visually exciting extravaganza with pyrotechnics, animated projections and visual illusions. ‘Stardust’ runs on Tuesday 19th, Wednesday 20th and Thursday 21st of November 2013 at 7.30pm in the Aberdeen Arts Centre. Tickets are available to purchase at £12 full price and £8 Concession from the Aberdeen Arts Centre (01224 635208) or online www.aberdeenperformingarts.com/events/stardust. Robert Gordon’s College is an independent school in the heart of Aberdeen educating pupils from pre-school nursery through to Sixth year. 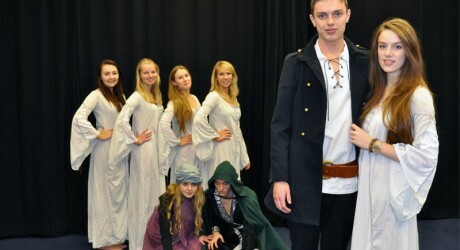 Drama is taught throughout every year group in the school curriculum. PRESS RELEASE issued by Robert Gordon’s College. You too can post your story ideas for journalists (aka press or media releases), on allmediascotland.com. Email info@allmediascotland.com for more information.